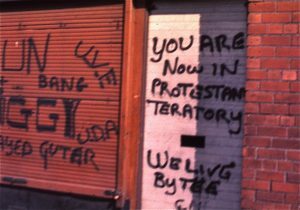 The Troubles were a violent time period which produced peacelines and and a myriad of art which included murals and graffiti. Peacelines were these huge walls that stand over 50 feet that were placed in areas of strife between Loyalists and Republicans. The concept of these walls were first developed after a riot for civil rights occurred on August 16, 1969 where violence between the two groups got chaotic enough that a human chain of soldiers had to be formed. 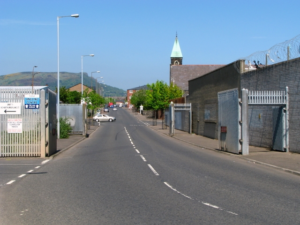 A month later, a wall was built in the predominately Republican Falls Road and Loyalist Shankill Road. (1) While these walls were intended to reduce violence, an unintended effect of these walls was cultivation of murals since the walls were a popular medium choice. 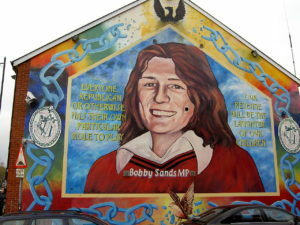 Before I get into my post, I wanted to let you know that I’ll be focusing on murals in Belfast. 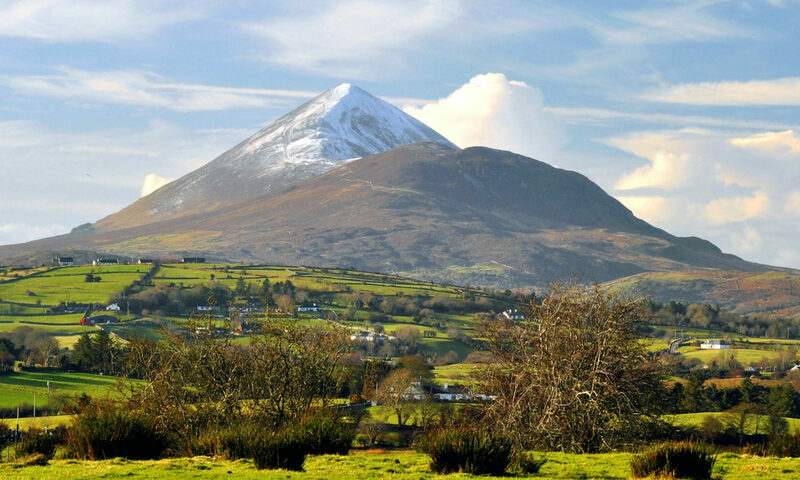 If you’d like analysis in a different part of Northern Ireland, I would check out Eamon’s post which covers borders and boundaries in Derry and more. Throughout history, art has always been a powerful and disruptive force used to convey discontentment be it socially or politically. However, an overlooked component of art is its ability to demarcate based on imagined communities. While we often associate graffiti to gang-life in New York and maybe California (sorry as a New Yorker I need to represent), the Republicans and the Loyalists in Belfast were arguably the original gangsters. 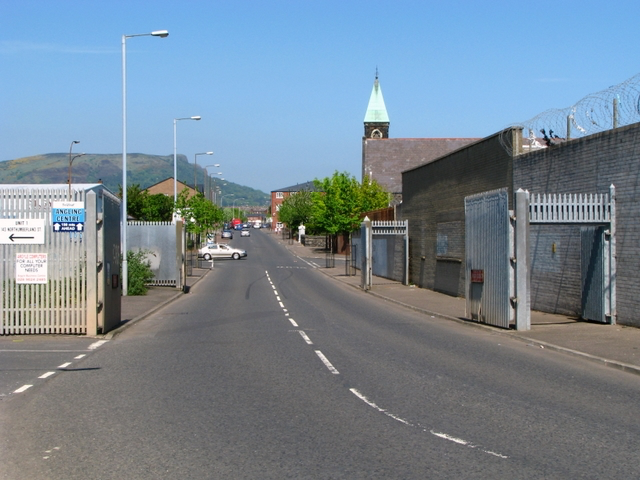 A prominent gang that emerged out of Shankill Road was the Shankill Butchers. This ferocious gang would kidnap and murder Catholics in a distinctive way: by slashing their throats with a butcher knife. Their actions would then send the message that Catholics were not welcome in their territory. Not that I was ever involved with a gang, knock on wood, but usually I find that they partake in forms of vandalization. 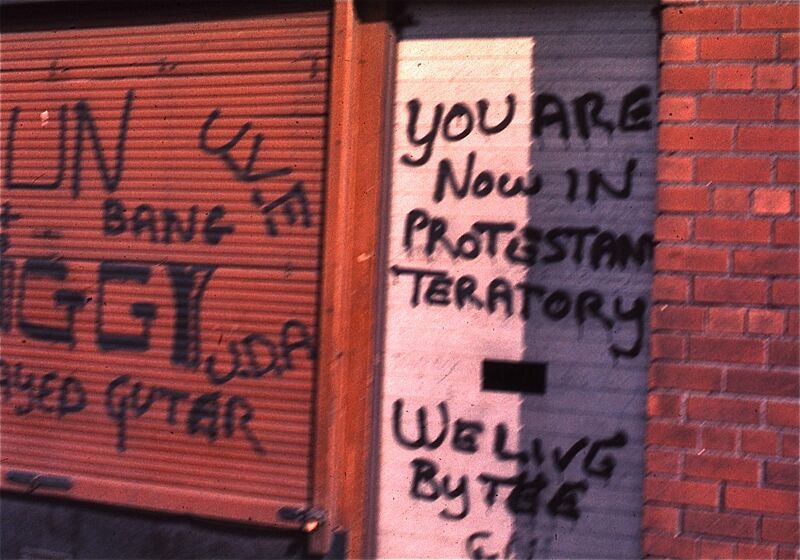 While gangs in the present day used random building walls as their canvas, Loyalists and Republicans had random building walls as well as peacelines. These murals served as identity markers and contained unspoken implications such as “pictures of hatred” that intended to intimidate and threaten the opposite community or empower people of the same imagined community. They were everyday reminders that outsiders were about to enter a territory that didn’t belong to them. However this interpretation is quite surface-level and the murals could be analysed further by arguing that they could also cross social boundaries and lead to further imagined communities amongst the population. 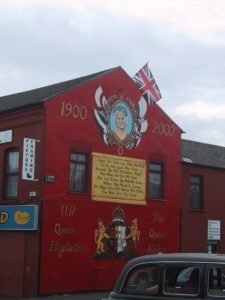 This mural contains iconic Loyalist symbols such as the Union Jack and the Queen. The showcase of this mural is similar to people in the U.S. displaying Confederate flags. Unlike the first mural sometimes art is more explicit in demarcating territories. This mural utilizes Argentine Marxist, Che Guevara. Both the Republicans and Argentines can relate to being oppressed. Bobby Sands, a member of the IRA who died on hunger strike. He was a popular symbol, particularly with the Republican community and his death attracted worldwide coverage. There were also murals for the feminist movements in both the Loyalist and Republican community and to represent the rising immigrant population with increasing Chinese, Indian, and Somali, and more. 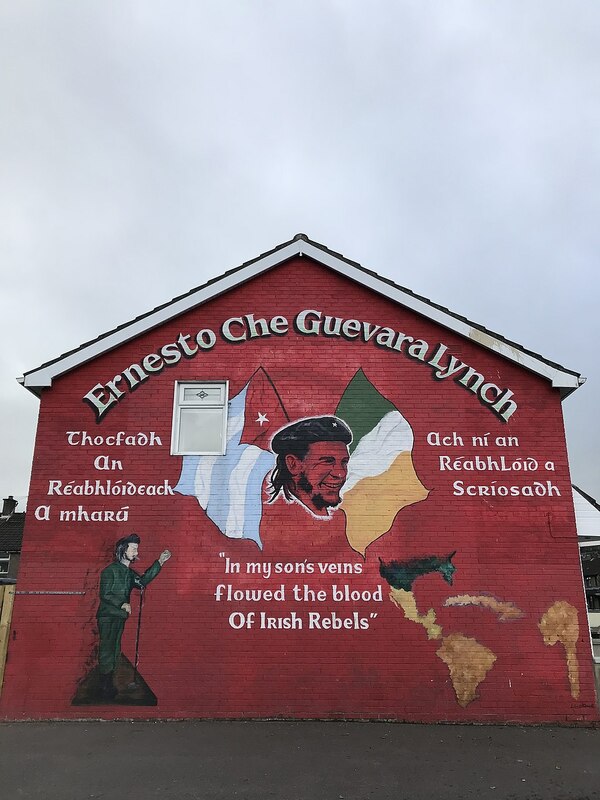 (2) Here’s a video that shows different murals that not only act as markers between Catholics and Protestant, but also bring influences from influential figures such as Che Guevara, Nelson Mandela and other causes such as support for Palestine. The combination of unjust behavior along with the murals reminding both communities of Belfast’s history is part of the many reasons why Catholics are still extremely angry even after when the Troubles were declared “over” with the Belfast Agreement in 1998. For more information on the Belfast Agreement, check out Carina’s post HERE. Other reminders such as the Orange Parades are also modern-day reminders of Catholic subjugation, which prolongs segregation, similar to how some holidays in the U.S. open up old wounds. The Orange Parades are considered a spectacle since it involves a marching band, thus disguising the meaning of the preservation of Protestant privilege. Thanksgiving is similar in the sense that its origins are disguised by traditional dishes such as turkey and pumpkin pie. We don’t think of Thanksgiving as anything harmful, except to our waistlines but to some Native Americans, they see it as a celebration of genocide to their people. My brief spiel aside, I would check out Natalie’s post which goes more in depth into Orange Parades. Following up, wouldn’t the easiest solution to maintain peace be to remove the Orange Parades? Not so much. There have already been debates on totally removing the march and even compromising with the march only staying on Protestant Routes. However, Protestant justification of the march is tradition. Because they’ve been marching for centuries, they can’t just take away a centuries-old tradition. What do you think we should do? I’ll part with this: We’re told to embrace our culture and celebrate tradition, but what if it’s at the expense of another group? Below I’ve compiled a list of suggested reading in case you’re interested in any of the topics covered in my blog post. Emily Ravenscroft (2009) “The Meaning of the Peacelines of Belfast”, Peace Review, 21:2, 213-221, DOI: 10.1080/10402650902877450. Debbie Lisle “Local Symbols, Global Networks: Rereading the Murals of Belfast.” Alternatives 31, no. 1 (January 2006): 27–52. doi:10.1177/030437540603100102. John Conroy, Belfast Diary: War as a Way of Life (Boston: Beacon Press, 1989), pg. 47-48.